Here you can buy a Thai specialty. 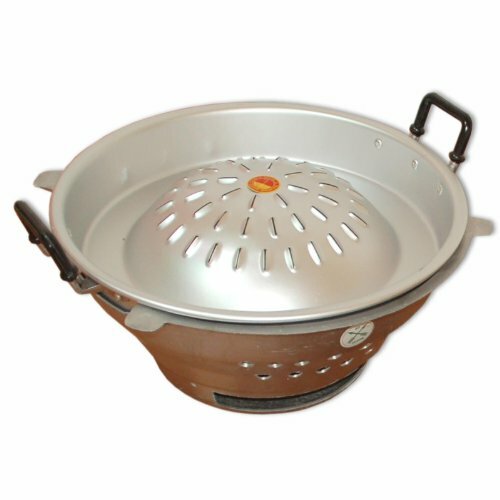 These appliances are imported from Thailand, the upper and lower shells are made of aluminum, stainless grille insert is made of cast steel. Quality is Thai, ie we are not talking about the "WMF quality", however just as enjoyable to use and does not affect the quality of the dish. Naturally, we tested for you this device and you will find below the demonstration in image. First, ensure that the coal is properly embers, we recommend the use of briquettes. It is judicious to prepare enough stock in advance (chicken or pork), so that the container can be re-filled if necessary. Slice your pieces of meat and vegetables in season. After installing the cooktop, you must first melt the fat on the area that is for grilling, it makes cleaning later. The piece of fat melt on top, pour the broth so that the curved part is half full. It is important to have enough broth into the trough. For desire and appetite of your heart, you can now enjoy comfortably. Enjoy your meal!